The two settlements are completely contrasting. One represents the inefficiency of the past, while the other is reinventing itself and creating a foundation for the future. The Komi Republic is a vast swathe of wilderness located in the north-east of European Russia, extending up beyond the Arctic Circle toward the Kara Sea. The region’s northernmost city, Vorkuta, lies at the far end of a railway line that stretches 2,500 km from Moscow. Surrounded by an alien landscape of barren tundra stretching to the horizon, this city of planned streets and apartment blocks seems absurdly out of place. Vorkuta was founded in the early 1930s on the site of a large seam of coal, and soon became one of the most notorious “islands” of the “Gulag Archipelago”, with 73,000 inmates by 1951. The camps eventually grew into a city, and the population topped 100,000 as people came in search of work, lured by the “hardship pay” given to those who braved the harsh climate and dark winters of Russia’s north. By the late 1980s the coal was running out and most of the mines had closed. Rising unemployment led many inhabitants to leave the city in search of work further south. The city’s population has been in continuous decline since the collapse of the USSR, and has almost halved since 1992. To walk the streets of the city today is to take a step back in time: Communist-era slogans proclaiming the glory of the city’s miners still adorn the rooftops and walls of many buildings, many apartment blocks lie empty, and the oldest district, Rudnik, has been completely abandoned and is now derelict. Outside the city, shuttered mines and Soviet-era industries slowly sink into the tundra between rotting Gulag camps. Vorkuta epitomizes the problematic legacies that Soviet central planning left upon Russia’s Arctic settlements – the drive to colonize the Arctic was largely based on the construction of mono-towns that grew out of what were originally labor camps. Russia is the only one of the Arctic nations that experimented with building whole cities from scratch in permafrost zones, and while the pioneering spirit of the Soviets was laudable, the idea of establishing entire communities in the tundra clearly has significant drawbacks – for a start, what do you do with the inhabitants of a city that has outlasted its raison d'être? It is difficult to be optimistic about Vorkuta’s future. Many inhabitants have taken advantage of a state resettlement program that offers them housing in other Russian cities, allowing the city to reduce outlay – but this is heavily oversubscribed and does not solve the essential problem. Others remain trapped in the city with no prospect of relocation. Tourism could alleviate the city’s woes, but a lack of infrastructure and investment makes success unlikely. In short - the outlook is bleak. Yet a day’s journey by train from Vorkuta will take you away from the dead mines and empty streets of this dying city to a symbol of the new Russian Arctic. Cutting east through the valleys of the pristine Polar Urals and into Siberia, the train ends its journey at the banks of the great Ob River. Here a ferry operates in the summer, carrying passengers and traffic the three miles or so across the river to one of Russia’s most affluent towns. Like Vorkuta, the city of Salekhard is a former Gulag whose economy is built on mineral resources, but this superficial similarity is deceptive. Salekhard has been standing on the tundra banks of the lower Ob for more than four centuries. Originally founded in 1595 as an outpost named Obdorsk, modern-day Salekhard is the capital of the Yamalo-Nenets Autonomous Region. 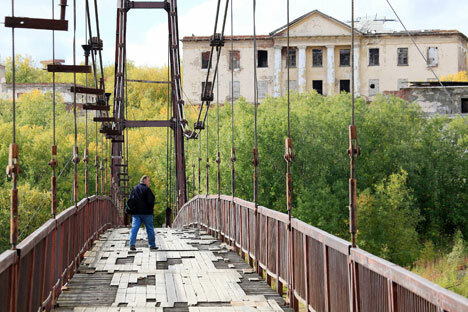 Tens of thousands of prisoners were put to work here in the late 1940s to build the Transpolar Mainline, Stalin’s grandiose project to link Salekhard with Igarka, on the Yenisei River, with an 850-mile railway across northern Siberia. Work ground to a halt after Stalin’s death in 1953 and the unfinished railway was abandoned. In the late Soviet period, Salekhard was an insignificant fishing town of ramshackle wooden houses, but its fortunes were transformed in the 1990s when preparations began to reap the vast wealth of the nearby Yamal Peninsula, which holds Russia’s biggest reserves of natural gas. To date, 11 gas fields and 15 oil, gas and condensate fields have been discovered on the peninsula and its offshore areas – with a staggering 16 trillion cubic meters of explored and evaluated gas reserves, and an estimated 230.7 million tons of condensate reserves and 291.8 million tons of oil. The Yamal fields have made Salekhard one of Russia’s richest cities. Modern Finnish-style apartment blocks, new roads and shiny office buildings have sprouted in place of many of the city’s dilapidated old districts, along with a sparkling steel and glass airport. Part of the Transpolar Mainline has even been resurrected, with a section linking Salekhard and the nearby city of Nadym currently under construction. Meanwhile, the population has grown by 50 percent since 1992 as workers flood into the city to work on the gas fields or provide labor for construction projects. Fishing remains a mainstay of the local economy and the city is planning an Arctic tourism center. With a standard of living that ranks among the highest in the country, it seems the future is bright for Salekhard – as long as the gas keeps flowing.